If you are into it, Wikipedia has a detailed history of the MGB cars: https://en.wikipedia.org/wiki/MG_MGB. If you don't have the time, in potted form, the cars were first released as a Roadster in 1962 and last manufactured in 1980. The design was very innovative for the time utilizing a monocoque structure instead of the traditional body on frame. This gave them both strength and light weight. Over 500,000 we manufactured in the Abingdon plant in the UK. They were also assembled in Australia from UK manufactured knocked down kits. Powered by an 1798cc motor and driven by a 4 speed gearbox through the rear wheels, they are stopped with front disk and rear drum brakes (not power assisted). Steering is rack and pinion which is again not power assisted. By today's standards, the steering is direct, but relatively heavy, the braking is slow as is the acceleration with 0-100kph in around 12 seconds. They are also small cars. But their beauty lies in their simplicity and light weight, which still makes them a fun car to drive. For our trip, it is the strength of the body and the simplicity of the engineering that makes them a feasible proposition. Plus the fact that there were so many of them built and many still on the road, parts are readily available and reasonably cheap. 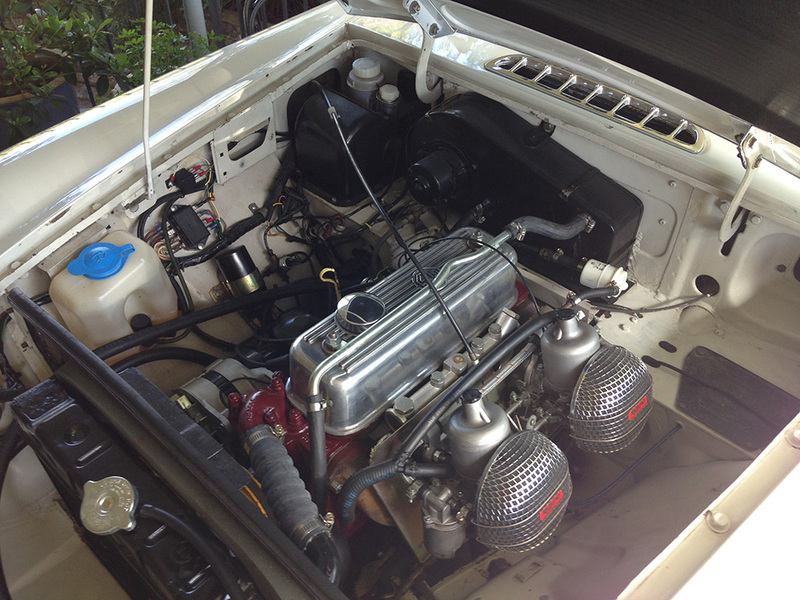 The car still has its original engine and Crystal White duco. These specifications mean that it has the stronger 5 main bearing motor and syncro on all 4 (forward) gears. For the travelling we want to do (long distance) the overdrive on 3rd and 4th gears is a must as it reduces the rev count and load on the engine significantly, as well as saving fuel. We purchased the car in Melbourne in January 2016. At that stage the speedo registered 87200 miles. But no record of how many times it has been around the clock as it rolls over at 99,999. However there were no available records of work done during its restoration. By and large the work done on it meant that it was still in its original condition which is a bonus as many cars have been significantly modified by their various well meaning owners over the past nearly 50 years. For our journey it was important to have a strong base platform to work with. The mechanical condition less so as we were going to replace, restore or upgrade most of the mechanical components as part of the restoration process to try to achieve the nirvana of mechanical reliability. The philosophy behind the work we did on all 8 cars was to try to stay aligned with each other so that if something went wrong, it would be easier to diagnose the problem and because we are carrying all our own spare parts on the trip (no back up support vehicles) then sharing parts become important. By and large that has panned out. The 5 cars from Melbourne, all MGB GTs have been restored together and as such are very similar. While the 3 cars from Sydney, all Roadsters, are pretty much mechanically identical. Overall we have generally decided against making major modifications to the cars on the basis that the original engineers knew what they were doing and also to keep things simple, especially in the case of the electrical systems. That said, 3 of the cars are running Toyota Supra 5 speed gearboxes. The Melbourne cars have made a couple of modifications not followed by the Sydney vehicles. They have replaced their Lucas alternators with a Nippon Denso equivalent and the rear lever arm shock absorbers with telescopic shocks. Although the cooling systems on the cars were generally pretty good, all cars have made some modifications such as the addition of an electric fan or a shroud. The engine has been completely rebuilt as we found that the cylinders were badly pitted as a result of sitting idle for extended periods of time. This involved a rebore, new rings and pistons, crankshaft reground with new bearings, new cam shaft and bearings, and the head has been tempered and valves replaced to allow the engine to run unleaded fuel. While being rebuilt, the engine specifications have not been upgraded, so it still develops the original 95 bhp. the alternator has been replaced with a new Lucas in line with the other 2 Sydney cars (the 5 Melbourne cars have had the brackets modified to accommodate Nippon Denso alternators). The starter motor has been replaced with a new high torque model (as have all the cars). The old distributor and points have been replaced with an electronic ignition kit. Oil cooler has been replaced. All leads, hoses and belts have been replaced. The clutch and thrust bearing have been replaced with a new heavy duty clutch. The gearbox has not been overhauled as its pretty tight and noise free. Generally they are pretty robust, evidenced by the fact that in later models, the same gearbox was mated quite successfully with the 3.5 ltr V8. Again the diff is original. Its been re-shimmed to remove any play. All wheel bearings, engine and gearbox mounts have been replaced. All 4 splined wheel hubs have been replaced as they were worn out and 4 of the 5 wire wheels have been replaced as they were showing considerable spoke deterioration and spline wear. Out of the eight cars, only two of us will be running wire wheels, the others are all running the steel Rostyle wheels. The front coil and rear leaf springs have all been replaced with heavy duty MG RV8 springs. This has lifted the car unladen, by around 2" from its original specifications. Shock absorbers have all been replaced, but we have elected to continue to use the original lever arm shocks rather than changing to telescopic shocks, to keep things simple. Of course all mounts and bushes have been replaced as well as the kingpins. The front disk brake calipers, wheel cylinders and brake master cylinder as well as all the rubber hoses have been replaced. Clutch master and slave cylinders similarly. The fuel tank was relatively new, so it has just been flushed and cleaned. We have also installed a 3mm rubber mat covering the tank as its made from a light steel and do not want to risk stone damage. The original SU fuel pump was never up to the job and failed me in Goulburn (200k short of my destination) on the delivery drive from Melbourne to Sydney, so this has been replaced by a solid state Facet pump. The twin SU carburettors have been rebuilt from the ground up. And I could not resist in replacing the original paper air filters with sporty Ramflow filters as all the boy racers did in the '60s. All rubber hoses have been replaced and 2 in line fuel filters have been installed, one before the fuel pump and one before the carbies. The radiator has been rebuilt with a new core unit and the fan replaced with a new 6 blade high capacity unit with shroud. We have steered away from adding an electric fans as well, just to keep the electrical systems as simple as possible. On previous trips the water pump and thermostats have proven to be weak points so they have both been replaced, and an overflow tank has been added. All hoses have been replaced, plus we carry spares with us. Heat and noise are 2 of the biggest issues to be dealt with in MGB Roadsters, especially on long trips. At times it feels like you have your head in a jet engine and furnace under the seat. This can be very fatiguing. To combat this the whole interior of the car was stripped and lined firstly with a sound deadening material and then a thermal insulating layer before installing new carpets and interior panels. The original MGB seats were replaced with tombstone style Mazda MX5 seats, one of the few that will fit in to the car because of its narrowness. It was thought that this would be a cheaper option than rebuilding the MG seats and adding head restraints. However, after extending the side boulster and adding pump up lumber support it may have been a marginal exercise. But with 104 days of driving, seat comfort was deemed a significant issue to focus on. The audio speakers have been moved to the top of the pillars behind the doors, the closest spot to the ears. 4 power outlets have been added to run a cooler, GPS and charge phones, cameras and other devices while on the move. The vinyl hood has been replaced with a new zip out rear window style. This has significantly improved flow through ventilation and cabin temperature. As we could be experiencing temperatures well north of 30c across Iran and Turkey every effort to make the cabin comfortable in the absence of air conditioning is needed. Rebuilding the car has taken 12 months of solid work. I started out with the intention of doing most of the work myself. However, the limitations of time, skill and available workspace seemed to get in the way. Stuart Ratcliff of the MG Centre of Sydney www.classiccargurus.com.au/MG_Centre_of_Sydney has not only done much of the mechanical work, he has provided the guidance and a steadying influence for the 3 Sydney cars. Mike Herlihy, our team leader from Melbourne was always at the end of the phone to provide guidance and experience when a thought bubble emerged or Google and the MG Forum provided conflicting advice. Tony Dixon skilfully refitted the MX5 seats to our particular body shapes and trimmed Everflex and fastners into some beautiful and practical tool and hood storage bags.